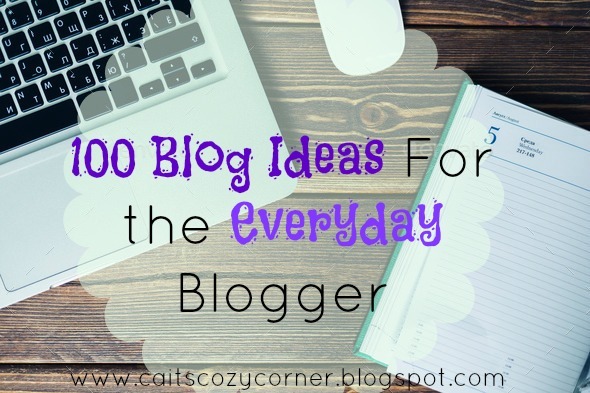 Cait's Cozy Corner : 100 Blog Ideas For The Everyday Blogger ! 100 Blog Ideas For The Everyday Blogger ! Let's face it. We all can get into a great groove of writing but there are times where are minds end up blank and we have no idea how to get started. Since I've been blogging for almost 6 years, I've had my fair share of some great ideas and some not great ideas. If you're in a slump and searching for some answers, I'm hoping these can get you out and back into your creative place! OMG, best blog post ever!! I am definitely going to borrow these!! you rock! definitely feel slumpy but I still love it. love all these post ideas! sometimes i feel so uncreative! Totally pinned that to keep for the future! Love this! Thanks for the ideas! These are great! Thank you! I appreciate that you're always willing to help & support other bloggers! Have a great day! Great ideas! Pinning this for when I need it! These are great ideas! I am pinning this for later, when I get stuck! Great ideas! I will use some of these!